Mappa geographica, complectens I. Indiae Occidentalis partem mediam circum Panamensem II. Ipsumq. isthmum III. Ichnographiam praecipuorum locorum & portuum ad has terras pertinentium. / Carte des Isles de L'Amerique et Deplusieurs Pays de Terre Ferme situes su devant de ces Isles & autour de Golfe de Mexique. A wonderful example of J. B. Homann's spectacular map of the West Indies. Consists of maps based upon the admirable work of D'Anville complied into a single sheet. 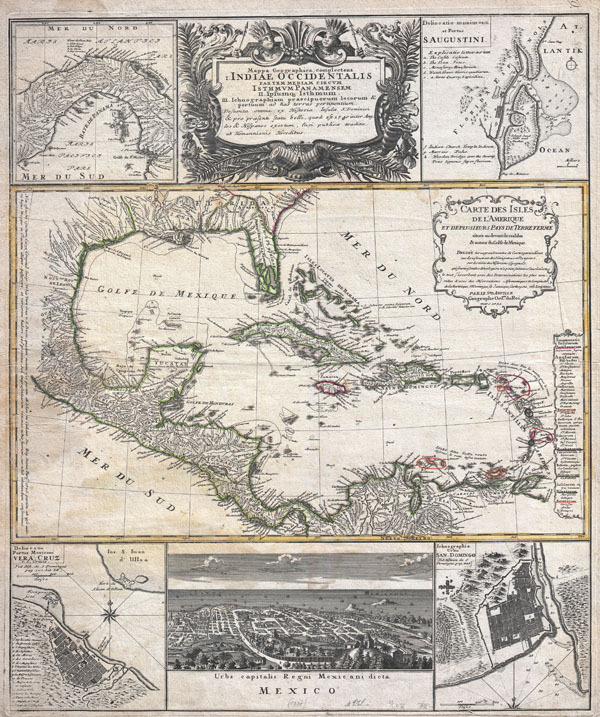 The primary map, attributed to D'Anville's work of 1731, depicts the West Indies from Mexico to the Lesser Antilles including the totality of Florida, parts of Carolina, and parts of northern South America. Southern Florida, in an attempted rendering of the Everglades, is shown as a series of lakes and islands connected by narrow canals. New Orleans and the mouths of the Mississippi are shown with relative accuracy as are Mexico and the West India Islands. Territories are color coded according the colonial powers that ruled them. The smaller maps include, from the top left, the Bay and Isthmus of Panama. In the upper right quadrant there is an excellent depiction of the port and harbor of St. Augustine, Florida. This is one of the earliest obtainable depictions of a harbor in Florida. The lower left quadrant features an inset plan of the city and harbor of Veracruz, Mexico. The lower right quadrant offers a similar plan of the city and harbor of San-Domingo. The bottom center features a splendid view of Mexico City, Mexico. The top center is adorned by a marvelous floral title cartouche depicting two Amerindians wearing elaborate feather headdresses and holding serrated spears. One of Homann's more interesting maps of the Americas. Very good condition. Minor water stain on left side, center. Original centerfold. Else clean. Kapp, Kit S., 'The Early Maps of Panama up to 1865', Map Collectors Circle, Issue 73, no. 58. Lowery, Woodbury, The Lowery Collection: A Descriptive List of Maps of the Spanish Possessions within the Present Limits of the United States, 1502-1820, 360.